South Africa by car: Zululand (KZN) and its diversity. The Kwa-Zulu-Natal (KZN) state, AKA Zululand, is a big, diverse and fascinating region of South Africa. We really like it! Complete. The mountains of the Drakensberg near Lesotho. The wildlife that you can see in its many reserves and a wonderful national park Hluhluwe-Imfolozi, and quite empty. The kilometers of coast and ocean. And even hippos and crocs for free! And also the small traditional villages that we found on the way, real black South Africa in some parts of the KZN, that we only saw in this region and in the Transkei. A tropical feeling with huge fields of sugar cane. Looking for more? You also find a big city, Durban, with its big indian atmosphere. Popular holiday destination and family beaches, on the tropical coasts north and south of Durban, called Dolphin Coast and South Coast. But we didn´t go there. We visited KZN between Lesotho and Swaziland, choosing only small roads and towns, avoiding toll roads with heavy traffic and Durban. Following only tarred roads (fine). In the main towns of KZN (it´s a quite populated area), you find supermarkets, gas stations, accommodation. Don´t worry! 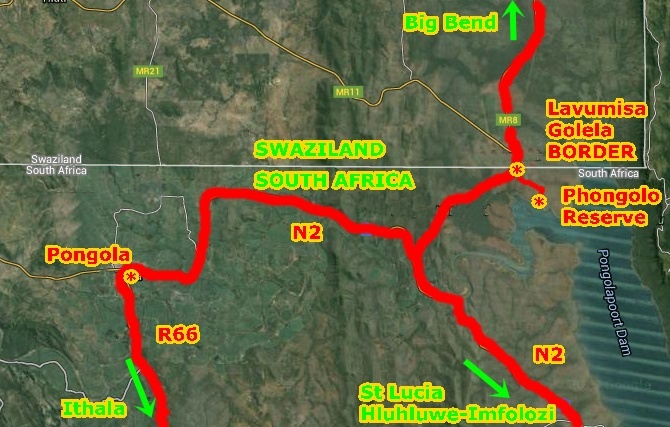 This was our route in KZN. In total, more than 1.000 km in more than 10 days. You can see the roads we used and the places where we stayed. The N3, Johannesburg-Durban highway (4 lanes), is a toll road with heavy traffic. 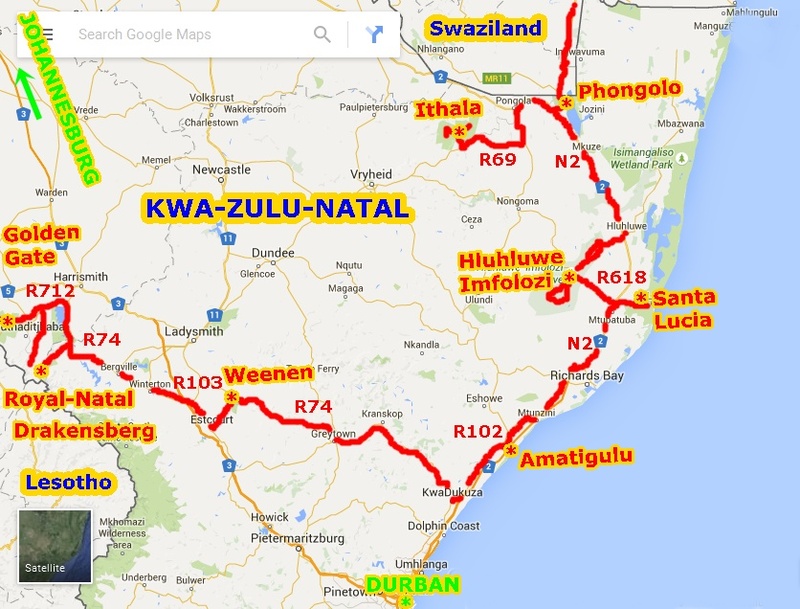 So does the N2 north and south of Durban (til Port Shepstone and Richards Bay). We avoid both, there are alternative roads and routes. They have a regional managment, EZEMVELO- KZN Wildlife. The entrance fee prices are quite cheap (cheaper than SAN parks, national managment ones). They also offer accommodation like SAN. Don´t miss Hluhluwe-Imfolozi! The oldest reserve in Africa is great! And very affordable entrance fee. Only 145 R/pp/day (10 €!). Here´s the detailed information about the places we visited in KZN during our roadtrip. We loved this area. Wonderful landscape with mountains, just at the Lesotho border. A paradise for hikers! Read the complete information about this part here. Note: if you have enough time, don´t miss Lesotho. You can see the information in the sidebar menu. A small reserve with very few visitors and some wildlife... in the middle of nowhere. Price for the entrance: 40 R, included with the Wild Card and also included if you camp. Price for the campsite: 170 R/2p. The campsite is just near the entrance, calm. Basic with BBQ and toilets-showers. We stayed there. Also chalets in the middle of the park. 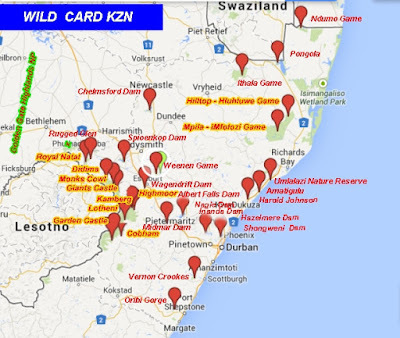 Complete information in the Ezemvelo-KZN Wildlife. We just saw zebras, antilopes, ostriches, wardhogs. But there seem to be also rhinos. There are a few short game drive loops, but the gravel roads are not always good enough for a sedan car. Nice place to stop on the way between Drakensberg and the northern coast of KZN. A small reserve, at the coast, between Stanger and Empangeni. Just 5 km from N2 and 6 extra km of gravel road (fine) from R102. Only small zulu village near. Lagoons and wild dunes near the ocean (only reachable by boat or kayak). Very few visitors. Gravel and sandy roads, access is fine with a sedan car to the camp. Very few animals (we saw zebras and monkeys, giraffes are supposed to be around too). 4x4 drives and a few walks. Price for the entrance: 20 R, included with the Wild Card and also included if you camp. Price for the campsite: 160 R/3 p. Basic but fine. Very quiet. Also tented camp. If you want to experience the wilderness and emptiness of the coast, it´s a nice place. St Lucia is a tourist spot. 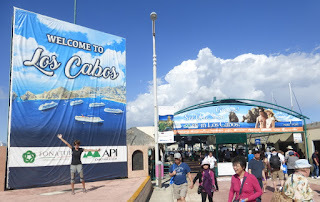 Plenty of accommodation, restaurants, real estate, activites, etc. There´s a good camping near the lagoon and river, Sugar Loaf, calm, with a big pool, good place to relax. And hippos and monkeys will be your neighbors. That´s what we liked in St Lucia. The ocean is rough, we didn´t see people swimming. There´s everything you need in St Lucia, many shops, banks, petrol, etc. Just a small supermarket (Spar). There´s a big and new shopping-mall in Mtubatuba and also big supermarkets in this busy town, 25 km away, on the N2. The main street has many pubs and hostels... so don´t expect a very quiet night! St Lucia lays in the Isimangaliso Wetland Park area but there´s no entrance fee in St Lucia. Other places of the park like False Bay, Cape Vidal (the gate is just a few km west of St Lucia, then it´s 35 km tarred road), Sodwana Bay, Kosi Bay have an entrance fee. The park is really big, many roads are sandy (inquire well first), there are different camps. 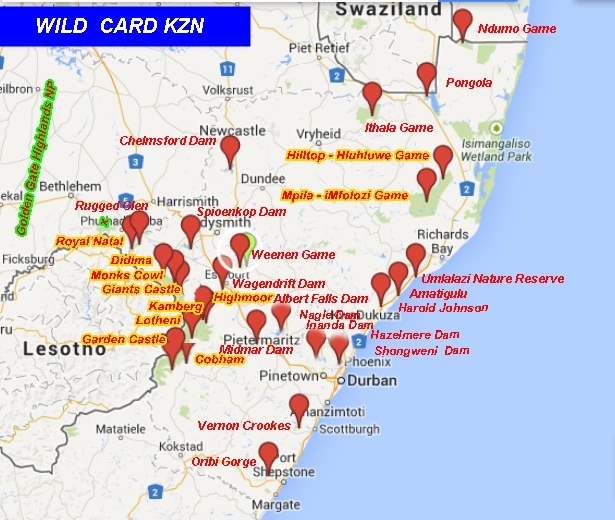 Isimangaliso is not included with the Wild Card. We just visited St Lucia. Many boat tours in St Lucia (around 160 R- 10 €), with Ezemvelo or other private companies. Popular for the sunset... and to see crocodiles and hippos (you can also see them from the shores, for free). We did not take one. 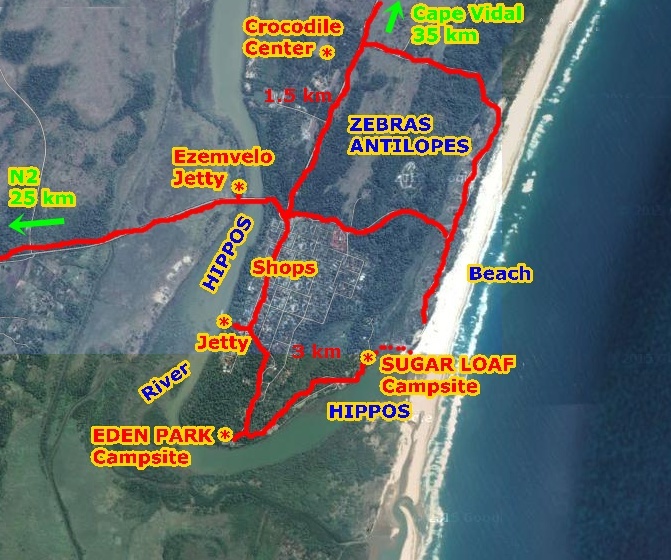 The Crocodile Center is 40 R (managed by Ezemvelo). We did not go. Where to see animals FOR FREE in St Lucia ? We expected to see much more animals in St Lucia, but the area is not so wild anymore and finally we saw just a few ones. 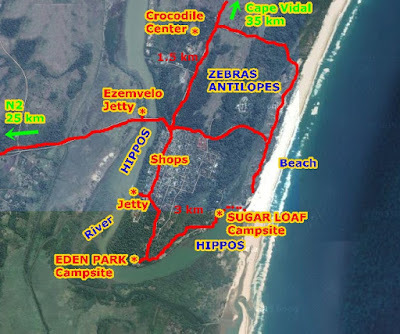 - Between the town and the beach, there are a few zebras and antilopes roaming around. - Hippos: there are in the lagoon and river. We saw them from the St Lucia entrance bridge and near Sugar Loaf campsite. You hear them! - Also crocodiles: we just saw one near Sugar Loaf. Like in all South Africa, if you want cheap accommodation you have to camp. Price for camping: 190 R/2 p.
We stayed at Sugar Loaf. Great location, out of town. Nice and quiet place! Really recommended. This is what we liked in St Lucia... with the pool (the ocean was too rough), the monkeys, hippos next door in teh lagoon... you can walk on the close beach and dunes. Consider that the last 2 weeks of December the camps are usually fully booked (same in Cape Vidal)! So if you are coming during these days, reservation in advance is necessary. We were just lucky enough to get there before! Other budget options in St Lucia (town): camping (around 80 R/pp) or dorms at the backpackers, but it´s another atmosphere. You are in the main street in the town. 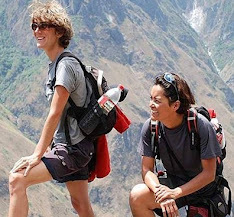 - Bib´s Backpackers (no more camping at Budget Backpackers, now upgraded). The oldest game reserve in Africa, created in 1895. We liked a lot this park, we really recommend it to you. See the complete information about this park here. A beautiful park, not far from Swaziland (around 100 km of the Golela border). Mountains, cliffs, hills, the landscape is really beautiful, and with wild life. Not many visitors (even in second half of December). But only if you have time and have the Wild Card. 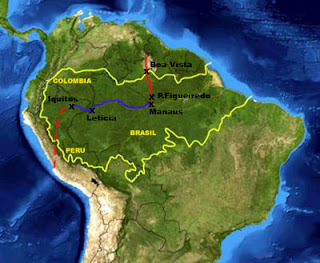 Home of 4 of the “big 5” (no lions... that´s why it´s not so famous). We did not see too many animals, because the weather was rainy. The elephants here are shy and elusive (we saw 2 from far away, but there was poo everywhere). Many leopards in Ithala but difficult to see them. We saw one black rhino, white rhinos, zebras, wildbeest, giraffes, antilopes, monkeys, birds. A few loops, not too long (the further point is 20 km away from the main camp). The main road is tarred, the loops are gravel, most are Ok for a sedan car and a few ones are only for 4WD. Price for the entrance: 60 R/pp/day, included with the Wild Card and also included if you camp. They give you a small map at the reception and more information if you camp. Open from 5:00 til 19:00 (summer). Road R69 from N2 (north of Mkuze) to Magudu is not tarred and it´s a bad gravel road for 50 km. Better to go up north via Phongola (specially if driving a sedan car), R66 is a good asphalt road and then R69 west of Magudu is also fine and tarred. From Louwsburg it´s just around 5 km down the mountains to the gate. Ithala is around 100 km from Pongola. There are supermarkets in the small rural town of Louwsburg, banks, etc., but bigger malls in Pongola on N2. There´s a petrol station at the main gate of Ithala. Where to sleep in Ithala? The accommodation inside the reserve is quite expensive, so, you have to camp if on a budget, but even camping is not that cheap compared with other reserves. There´s only "rustic" camping in Ithala and it´s 130 R/pp/day, at Doornkraal campsite, 20 km from the main camp Ntshondwe (gravel road) and 10 km more to the main gate. Even in mid-december, the park was quite empty. You don´t need to book in advance here as it happens in other places during Christmas holidays. We didn´t know it, and just in case, from St Lucia, we booked 2 camping nights in Ithala. There were only two families in the campsite and many free rooms in the main camp in Ithala. In Doornkraal, in the midlle of the wild, you will feel the animals close. No fences! Great experience! We heard elephants at night, approching our tent, very close, but we didn´t go out (very scared). First day sleeping under the shed of the "rustic" camp. Second day enjoying the luxurous chalet! We had booked 2 nights in the "rustic" campsite. But it was raining, the gravel roads were getting bad, there were rivers to cross... we had a sedan car... we were in the middle of nowhere with the elephants... We talked with the manager, looking for another place to camp, even without campsite, closer to the main camp. We were very lucky: he invited us to stay in a chalet, without extra charge. Thank you! Phongolo reserve is a very good place to stop for the night and camp on the way if you are going to Swaziland. 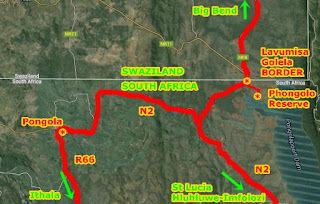 The gate is just east passing the border town of Golela (South Africa-Swaziland Golela - Lavumisa Border), on the northern shores of Phongola Dam, a few km away of N2. Roads are tarred, except inside the reserve, but good for sedan car. Many wild animals around the lake, even rhinos, hippos, crocs, buffalos, giraffes, antilopes, etc. Enjoy! The lake is famous for fishing specially the tigerfish (many people on holidays with boats). Price for the entrance: 25 R/pp/day, included with the Wild Card and also included if you camp. There´s a picnic area on the lake and a campsite, 5 km away from the gate. Recommended place if you are around Swaziland and north KZN. Calm and even with plenty of animals. There are small shops at the border town, Golela, and big shopping malls in Pongola (40 km). Also accommodation in Pongola. But it´s just a noisy, crowded town, with heavy traffic on N2. And the campsite is 120 R/pp. Easy border crossing to Swaziland. Here you can check some information about the Golela - Lavumisaborder.